I hear people say how expensive it is to eat Vegan. 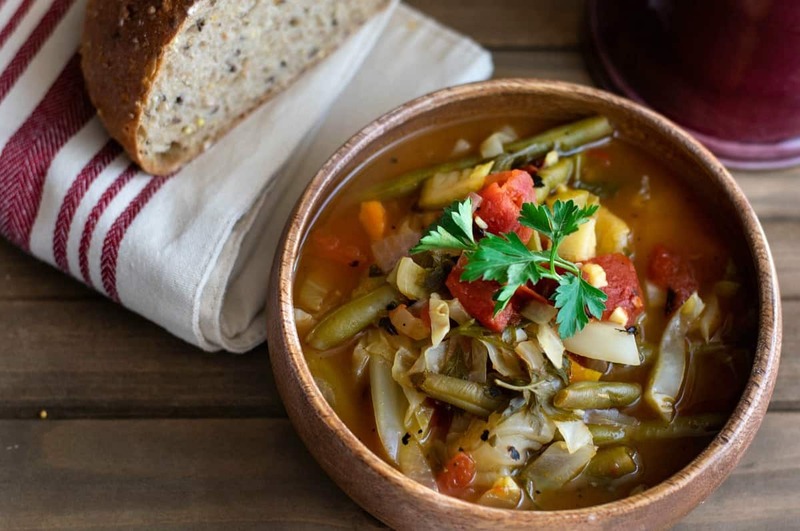 I beg to differ – a head of cabbage and a few vegetables are all you need to make this delicious Vegan Cabbage Soup. I think people are mistaken in thinking they need to buy the processed Vegan Crumbles, or Veggie Burgers, or Vegan Cheeses….. because those CAN be expensive. Or thinking they need to buy only organic or shop at Trader Joe’s or Whole Foods – which can ALSO be expensive. I shop at a regular chain Grocery Store for the majority of my recipes, and only on a rare occasion will venture out to Whole Foods for a special ingredient. So everything in this soup will more than likely be available at your local grocery store too and priced affordably. Another common excuse I hear is cooking is too hard or they don’t have enough time. I will say the veggie chopping will take a little bit of time, but once the prep work is done the rest of this is easy. Chop, add to pot, simmer 20 minutes. Nothing could be easier, or faster. And nutritious? This is probably one of the more healthier soup recipes I have made. This soup has it all: Protein, Fiber, Calcium, Iron, Vitamin A, Vitamin C, Potassium. Not to mention there is NO fat, NO cholesterol, very little sodium, and only 67 calories per 1 cup serving. 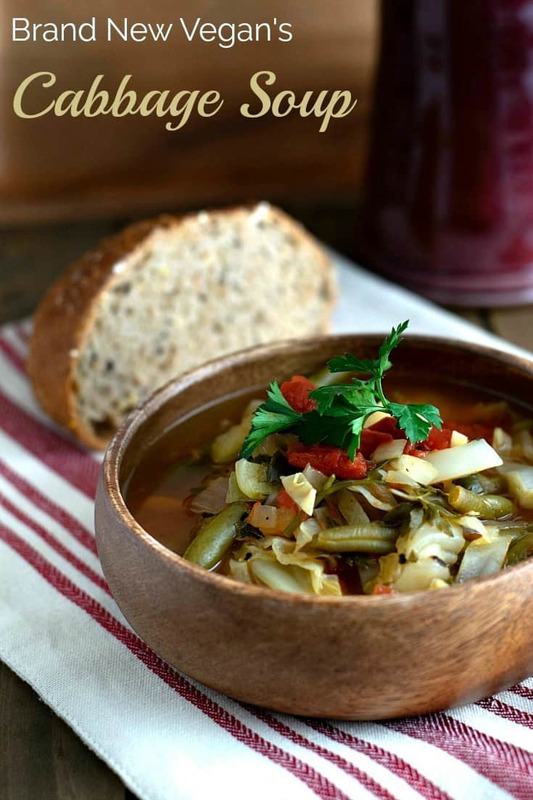 Nutrient rich and calorie poor – that ‘s what this Vegan Cabbage Soup is. Oh and delicious too – here we go. Start by dicing a large Yellow Onion and add it to a LARGE Stock pot. (I used a 6qt Cast Iron Dutch Oven and this recipe almost fills it up). Add a few tablespoons of water or veg broth to prevent sticking and begin to soften the onions over med-low heat. After a few minutes go ahead and add 4 cloves of minced garlic and give it a stir. While the onions and garlic are simmering, lets prep the rest of our veggies. Dice 2 ribs of celery, 1 carrot, and 1 parsnip and add them to the pot (you could always use a second carrot instead of the parsnip). Next, we’re also going to add an entire 10oz bag of frozen Green Beans, and 2 cans of Fire Roasted tomatoes (15oz ea) and give the pot a good stir to mix everything up. Let that continue to simmer while we prep the cabbage. We are going to use 1/2 head of Green Cabbage, so start by removing any outer leaves that look deformed, dirty, or otherwise nasty. Then make a clean cut on the stem. Next, carefully cut the cabbage in half right through the core (stem). Wrap up one half for later, and cut the remaining half into 2 pieces as well, again right through the core. Now you can easily remove the white triangle looking core near the stem. Slice the cabbage into strips, and by now you can add them to the soup pot along with 4 cups of the veg broth, 2 cups of water, 1/2 bunch of parsley leaves, and the seasonings. Stir well and bring the heat up to boiling. Once it begins to boil, reduce the heat and cover. Let the soup simmer for 20-25 minutes. Finally, after another good stir, season with a little salt, pepper, and 1 Tbs of Balsamic Vinegar. I know this makes a LOT of soup ( I did warn you) but it can easily be frozen for future meals, or you could simply cut the recipe in half. 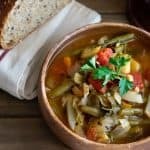 Vegan Cabbage Soup – full of all the good stuff, with none of the bad stuff, and only costing pennies per serving. Made my second batch (using other half of cabbage) this stuff is really good.. I’m a single dad and my daughter wants vegan. But this looks so much healthier and she loves it. She thinks I’m an awesome vegan dad/cook. Please dont tell her you showed me how! Lol. Thanks for sharing. Has anyone made in IP? This method has spoiled me! I also, would like to know if this can be made in the Instant Pot? I was going to ask that as well. I think at the very least it could be done on ‘saute’. So good! Have been wanting to try this recipe for a month or so. Very satisfying, will enjoy leftovers for the next busy days. Excited to try this recipe! Has anyone tried freezing it? Did it reheat well? Thanks! I had a head of cabbage and didn’t want to make coleslaw. OMG, this soup is outstanding! I would have never thought of putting fire roasted tomatoes in it…such great flavor! 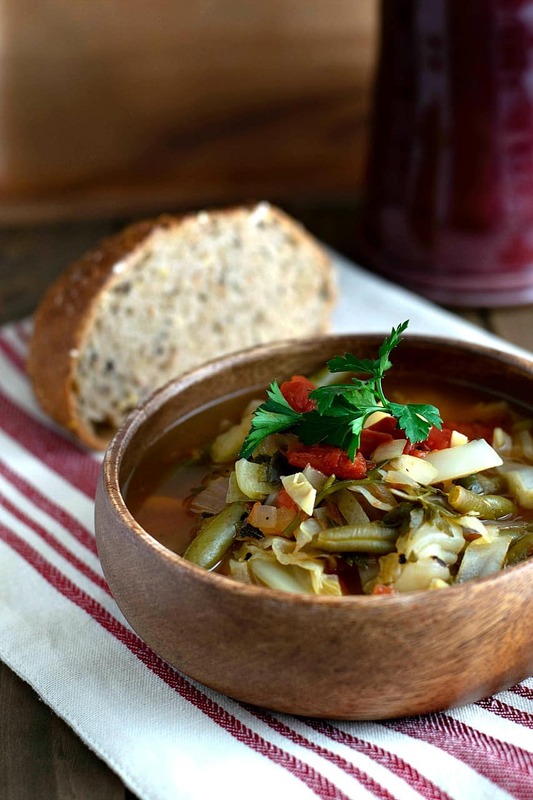 Whenever I think of cabbage soup I think of Weight Watchers. I wish I had this recipe back in the late 19060″s when I was eating so much of the no limit soup. This BNV soup is so hearty and flavorful that I could eat it every day. It’s great for breakfast too.